Wilson is a lively multi-function engine with oodles of enthusiasm and confidence. His eagerness isn't always matched by his ability to pay attention. 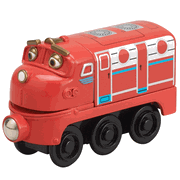 This Chuggington Wilson wooden engine is compatible with all Chuggington Wooden Railway tracks and train cars and most other wooden rail systems.